PERL - A Register-less Processor, P. Suresh. The question posed in this thesis is how relevant are the registers in modern processors. Why should one have registers in the processors especially in light of register renaming and caches. It has been shown that by not having the registers in the processors, compilers are simplified. In addition the hardware for decoding the register address space and associated handling of data dependencies gets simplified. The performance of such a system is generally better than the register counterparts. Privacy-enhanced location-based services. Apurba Sarkar. This thesis is aimed at developing a security architecture framework for defining the security needs to protect privacy of data in a location-based service. (Ongoing). Models for election cash-less transactions with localized protocols. Satyam Sharma. This thesis is aimed at using verifiable, trusted and tamper proof services for electronic cash-less transactions in customer-merchant relationship. (Ongoing). Debug Support for Retargetable Simulator FSim Using GDB, Hemanth Shinde. 2008. Design and Implementation of an OSD System and Prefetching Models, S Riyaz. 2008. File System Independent Metadata Organization for TransCrypt, Arun Raghvan. 2008 (with Dr. Dheeraj Sanghi). A Device Mapper based Encryption Layer for TransCrypt, V Sainath. 2008 (with Dr. Dheeraj Sanghi). SmartRF: A Flexible and Light-weight RFID Middleware, Anirudha Ghayal (with Dr. A R Harish). 2008. Generic RFID Application Framework, Zuber Khan. 2008 (with Dr. A R Harish). Implementation of SCOSTA-CL based Smart Card Operating System (SCSOS), Deepak Shahji Nagawade. 2008. Design and Implementation of Public Key Infrastructure on Smart Card Operating System, Aditi Gupta. 2008. Development of an Operating System for Smart Cards, S. Ravinder, with Dr. Deepak Gupta, 2002. Userdev: A Framework for user level device drivers in Linux, V. Harikrishna, with Dr. Deepak Gupta, 2002. ISCII-HTML document support for existing Internet browsers, Ashok Bhat. 2002. Generic Disassembler using Processor Models, Prithvi Pal Singh Bisht. 2002. Iterm - Multilingual X-Windows Indian Script Terminal, Jyotirmoy Saikia, 2002. High Level Synthesis from Sim-nML Processor Specifications, Souvik Basu. 2001. Generation of GCC Backend from Sim-nML Processor Description, Soubhik Bhattacharya. 2001 (with Dr. S. K. Aggarwal). An approach towards Real-time Distance Education using Web Server Streaming, Ashwini Damle. 2001. Instruction Cache Address Prediction for Superscalar Processors, Shankar Seal. 2001. Generation of Assemblers Using High Level Processor Models, Sarika Kumari. 2000. Speaker Independent Isolated Digit Voice Recognition Using Discrete Hidden Markov Model, K Vasudeva Rao. 2000. Implementation of MPEG-2 Video Decoder using an associative array processor, Samarpit Bhatia. 2000. Retargetable Profiling Tools and their Application in Cache Simulation and Code Instrumentation, A R Rajeev. 1999. Implementation of an MPEG-2 Video Decoder, Subhendu Bhadra. 1999. Retargetable Functional simulator, Y Subhaschandra. 1999.
µItron Interface for a Generic Modular Embedded Operating System Platform, A. Sridhar. 1999. A Web-based Search Engine for Indian Languages, Manoj K Malviya, Jointly with Prof. T.V. Prabhakar. 1999. Disassembler using High Level Processor Models, Nihal C Jain. 1998. Design and Implementation of a File System with on-the-fly Data Compression for Unix, B. Praveen. 1998 (with Dr. Deepak Gupta). Architectural Enhancements in PERL processor, Suraj K Bhatnagar. 1998. 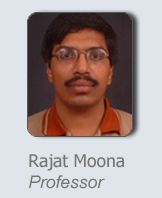 A Generic Approach to Performance Modeling and Its Application to Simulator Generator, V. Rajesh. 1998. Iterm - Indian terminal emulator for X, Nitu Choudhary. 1997. A Modular Kernel Architecture for Embedded Systems, Kshitiz Krishna. 1997. Application Specific Integrated Circuit for Electrical Instrumentation Processor, Milind Parab. 1997. Design and Simulation of PERL RISC, T S Balaji. 1997. C Compiler and Cache Performance Studies for PERL RISC Processor, Ramana Kumar. 1997. Process migration for load balancing, M L Prasanna Kumar Reddy. 1996. A Reliable Network Boot Service for PCs, Bhartendu Sinha. 1996. A Generic File System Interface for Embedded Kernels, R Ganeshan. 1996. Program Development Environment for Twine RISC, Shyam Sundar Palreddy. 1994 (with Dr. S K Aggarwal). A Multitasking Kernel under MSDOS, Y S S Krishna. 1994. Remote Multiple Access of CDROM Information over a Network of DOS PCs, Navdeep Sood. 1994 (with Dr. K R Srivatsan). Design and Implementation of a Link Adapter for Circuit Switched Multicomputer Networks, Indraneel Sarkar. 1993. Design of Twine-RISC, Dinesh Rao B. 1993. Design and Implementation of a 32 bit VLSI RISC Architecture, Anil Kumar. 1993. Design and Implementation of Distributed Programming Primitives for Workstations, Harshad G Parekh. 1992. Design and Implementation of KIMS Multicomputer System, Bhaskar Chowdhuri. 1992 (with Dr. R.N. Biswas). Twine RISC: Architecture and Performance Evaluation Study, Dhiren Patel. 1992. General Purpose Simulator for Multicomputer Architectures, Y. Jayashri. 1992. Implementation of UNIX on a Message Passing Architecture, B S Pawa, 1991. IISc Bangalore. Using Personal Electronic Device for Authentication-based Service Access, Vikas Gelara, 2008. Design of an embedded board using ARM processor, with support for Smart Card Interface, Nishith Khantal, Aditya Gupta. 2008. Implementation of Breakpoints in GDB for Sim-nML based Architectures, Amit Gaurav 2007. Smart Card based application for IITK Swimming Pool management, Ankur Mittal. 2007. Public Key Infrastructure in SCOSTA, Venkata Rao Pedapati and Sri Simil Dutta. 2007. Memory Profiling in Sim-nML, Bhupesh Chandra. 2007. Memory Management using Dynamic Memory Switching, Sharad Chole and Sanchay Harneja. 2007. Hardware Implementation of a Flight Control System for an Unmanned Aerial Vehicle, Pankaj Maurya. 2006.